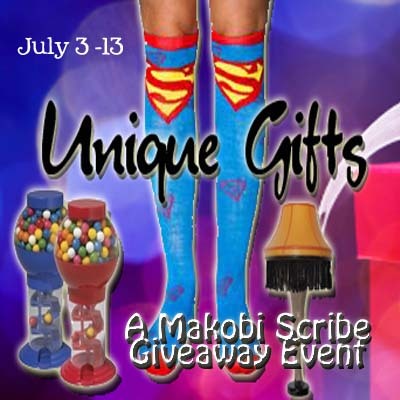 Welcome to the Unique Gift Ideas Giveaway Hop brought to you by Makobi Scribe who is hosting the event with a Sumo Lounge Beanbag Chair as the Grand Prize! You’ll have the chance to Enter Giveaways and Win Prizes from 75+ Bloggers! After you enter our giveaway, visit the other links for chances to win fantastic prizes! You’ll also get some great ideas for unique gifts and products to try! We recently had the opportunity to try some fantastic products from Soggy Doggy including their extremely absorbent Super Shammy, Door Mat and Slop Mat. All three items are designed to quickly absorb water, dirt and mud and work WAY better than any regular towel or rug we’ve seen! You can read our Soggy Doggy Product Review here to learn more! 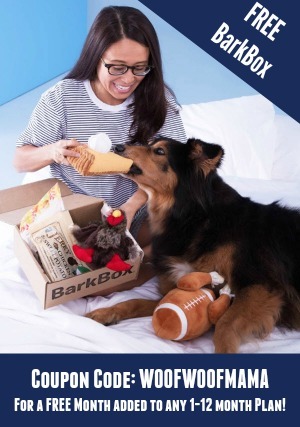 We know from using them ourselves, that every pet parent could use a set of Soggy Doggy products for their home, and that they also make an excellent and Unique Gift Idea, so we are hosting a Giveaway! 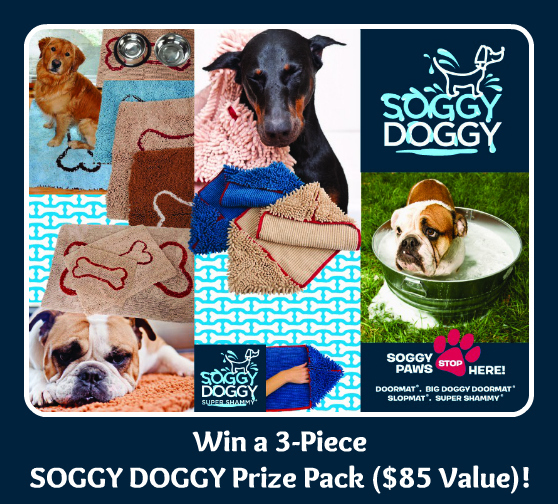 Soggy Doggy is giving one lucky reader their very own trio: a Soggy Doggy Door Mat, a Slop Mat for the feeding area and a Super Shammy to help try those wet and dirty paws at the door! 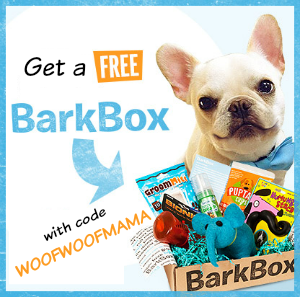 And just in case you can’t wait to WIN a set, they’re also giving our fans and readers an exclusive discount of 20% Off your online order when you use Soggy Doggy Promo Code WoofWoof20 at checkout! 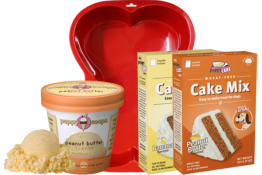 This giveaway runs thru July 13, 2012, is open to US residents age 18+ and uses the Rafflecopter Widget for FAST and EASY ENTRY! There are many OPTIONAL entry methods to give you additional chances to win, but just choose the ones you want. Email addresses and other info are only used to verify and contact the winner. Rest assured that your information will never be sold or shared with anyone. All entry methods are subject to verification. Please make sure you provide all required information or your entries won’t count! i like the Soggy Doggy Super Shammy best. my boys hate to be wet, but they Love the Towel. The super shammy she likes to run through the mud all the time and jump on me when I have white on! Love her! I definitely need the door mat, with four dogs it will help cut down on paw prints! I really need the super shammy. My dog makes quite a mess at his water bowl. He likes to use our clothing as a napkin! He also likes laying in the dirt, which of coarse means bath time! I want to win the Soggy Doggy prized so I can clena Siren’s paws after walks outisde on wet.muddy days or after trips to the beach. I already have a placemat that works well for under her food and water dishes, so I would give the Soggy Doggy feeding mat to Siren’s best doggy friend, Bugaboo. I have 2 mastiffs, need I say more about why I desperately need these? Especially since one has a partially paralyzed tongue that hangs out of her mouth ALL the time. Her water bowl drips extend across the kitchen floor. No bare-feet in that room! It’s hard to pick a favorite, because all 3 of them would come in handy, but if I have to choose one, I’d say the door mat to catch wet and muddy paws when Shiloh comes inside. The house we’re moving to has a sliding glass door for entry to the back yard, and it’s in a carpeted area, so we will need something to catch the dirt before he walks on the carpet. I need the Soggy Doggy Super Shammy for my new rescue dog that loves the water. We even went out and got Artie a wading pool. He is learning his commands and doing great as a house dog. Definitely need the shammy for my dogs as one LOVES to play in the sprinklers. I have a St. Bernard and it is difficult to pick just one. We could use the Soggy Doggy Super Shammy to clean up because he drools all over. Oh, we so need this. My dog is tiny but she makes a big mess by digging up my garden all the time! My St. Bernard likes to get in the river and then roll in the sand. My dog likes to dig in the yard :/ She is half lab and half bernese mtn dog so she is huge and hairy and tracks in EVERYTHING!! My doxies are too low to the ground and so their bellies are always getting messy! I would like to win the slop mat for my fiance’s dog Hami. When he drinks, he sloshes water from his furry beard all over the floor. He never misses a mud puddle and if I am not careful will roll in the mud. They get messy at the beach, although they love the beach! Casey is a huge, shaggy galoot, a goldendoodle who lives with me in rainy Seattle. Rain or shine, we’re at the dog park…90% of the time he comes home wet, either from swimming, from the rain, or from being hosed off at the gate. The Super Shammy would be most useful for Bentley. Whenever he comes in from the rain he dives onto the living room rug and of course “dries off”. 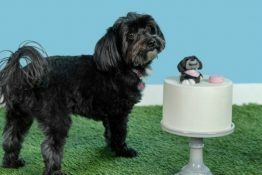 I am excited about all of the items, but I think my dogs will love the super shammy. When it is muddy, they track in. Once in a great while, one of them will roll in something yucky in the yard. Thanks for the chance to win! My 2 black labs get messy if its muddy out they will find it and lay down in it. Need the super shammy. My little guy always runs straight from the door to the couch. Not fun on rainy or wintery days. Need something to stop that. My longhaired dachshund, Ralphie, is so low to the ground that he tracks stuff in on his belly and paws even if it’s not wet (but especially when it’s wet) including mud, grass, little sticks and seedpods, etc. so this would be great to have, all of it! Dumpling would need the Soggy Doggy Slopmat the most! WE have two dogs that love to get messy in the yard however they can! Would love all these products. My dogs make a huge mess with their water bowls, this would help a lot! I will be gifting this to my cousin, who’s giant golden retriever, Rasta, loves to go to the beach and what a mess that makes! gifting them to blue my schnauzer he would love all this gifts plus very much needed.. I have 4 dogs and really need the door mat and the dinner mat. would love to have the doormat, with 3 dogs it can get really messy. I think the shammy will be the most useful. Molimo is a true water dog. If it’s within a mile, it’s on her. The Slop Mat would be a wonderful addition to our back door. If lucky enough to win my two baby girls Sugar and Cinnamon will be happy fur babies. My three Standard Poodle girls , Jazz 12, Jade 8, and Issabella 1, are the neatest and cleanest girls in the world>> of course there is an occasional piece of dirt that jumps on them so the slop mat would be wonderful to have for Jade>> and the rain sometimes dampens Issabella’s coat so the shammy would be wonderful for her>> and Jazz is such a lady the place mat would be perfect for her… Thank you for the chance to win! When she gets messy it usually is in the kitchen, if someone lets her in after she has been in the pool, she gets water everywhere! I’m excited about the Soggy Doggy Slopmat…my dogs make a mess! My little dog gets messy by rolling around in the grass and dirt especially when it is wet. Always right after he has been groomed and after I have cleaned the floors! I like the doggy door mat. Our dog makes the biggest mess with paper. Doesn’t make a mess of herself, relaly, but leaves a huge mess of the house whenever she gets hold of newspaper, toilet paper, tissues, tissue paper, you name it, if it’s paper she must dive in, tear it apart, and eat a little in the process. They get dirty at the beach (looove the beach) and at the dog park…and well anywhere they can lol! REALLY need the super shammy! We have 3 dogs (lab, beagle and peekapoo). I would gift this to my brother-in-law. He has an english mastiff that drools and gets dirty quite a bit. He’d love it to keep him clean. Vix gets messy going into the yard. I live in Western Washington (state) and it rains a lot. My yard has some bare patches where I can’t get grass to grow so she is always getting muddy. Then too we walk in the water at the park. Not to mention that we have to walk in the rain in Winter and Spring – sometimes we have rain for a couple weeks at a time. Poor baby can’t help getting wet and messy. Thanks for the giveaway. I am a Cavalier King Charles Spaniel Breeder, these are a must! Doormat…YES! Shammy for those long luxurious ears after a drink or bath…YES! Wouls love this!! Thanks for the chance to win! My dog always gets messy by having a good swim in the pond near our house. Love the mud. The door mat. I would gift this to a family with two little girls and a brand new home; the girls are getting their first dog when they move in next month. I have a big labradoodle who is outside so I would gift these to my niece and her 3 inside dogs! My dogs are such dogs! They love to roll around in the dirt even if it’s wet from ran or snow! I love them but they are messy creatures. My dog gets messy by running into the pond and then rolling in the grass…always when it is fresh cut! my 4 dogs LOVE to get messy by playing in the mud, they just cant get enough of it. Being honest here. Our dog is messy, but so are our cats. Dirty paws and messy while eating–describes all our animals. My Moxie likes to roll in other dogs poo. Yuck. Sooo, LOTS of baths. My dogs only get messy when it rains. Then muddy paw prints! However, my Rex likes to shred paper, so that makes a huge mess! I have a dog that loves to rub in stinky mushrooms. Thanks!! Occasionally my chihuahua will urinate on my other dog! Yuck! i will be gifting for the girl. she just got a new pup. mine keeps knocking over his water dish.. 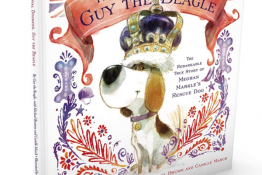 I would give it to a niece who has a lot of dogs. My Melly Beans gets messy at the park. I love to take him in the water when it’s hot. He only goes up to his belly but we could use a shammy for the car. Our Gemini doesn’t get too messy though she truly loves rolling in the grass. I love the idea of the slop mat because she drinks and half of the water gets sprayed out on the floor. I have a garbage digging chihuahua. You can always tell when trash days are by smelling him. I would gift it to my mother who has bigger dogs!